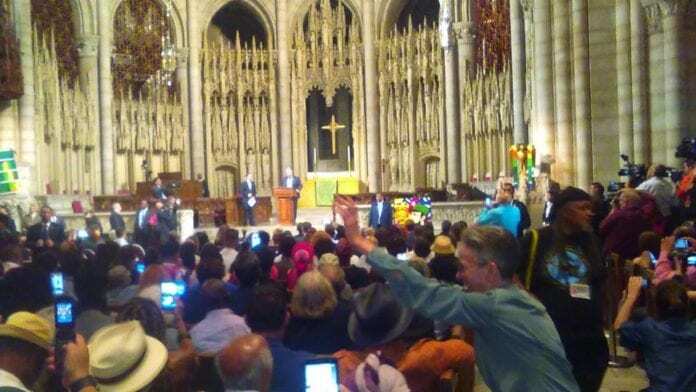 Cuba President Miguel Diaz-Canal Bermudez speaking to over 2,000 people at Riverside Church in New York City on September 26, 2018. Making his first visit to the United States as head-of-state, Republic of Cuba President Miguel Diaz-Canal Bermudez delivered an impassioned speech before the 73rd Ordinary Session of the United Nations General Assembly (UNGA) on September 26. Defending the sovereignty of Cuba and other states throughout Latin America and the Caribbean, Diaz-Canal emphasized that the nations within the region had a right to adopt the political and economic system of their choice. The address appeared to be a refutation on the character of the speech given by U.S. President Donald Trump one day earlier. Trump launched a tirade against Venezuela and Cuba stating that socialism was a failed system. Although relations between Cuba and the U.S. were restored on July 20, 2015 after the severing of ties at the aegis of Washington in 1961, the economic blockade against Havana remains intact. Although former U.S. President Barack Obama led the initiative to re-establish diplomatic ties, his predecessor Donald J. Trump has escalated hostile rhetoric towards Cuba. This diplomatic break in 1961 took place amid numerous attempts by the Central Intelligence Agency (CIA) to overthrow the revolutionary government then led by Prime Minister and later President Fidel Castro Ruz (1926-2016). Fidel handed over power to his younger brother Commander-in-Chief of the Armed Forces Raul Castro in 2006. He had maintained control of the council of state and ministers until April 19 of this year. Raul remains First Secretary of the Central Committee of the Communist Party of Cuba (PCC)). In his address to the UNGA, Diaz-Canal spoke to the international delegations on the character of capitalism and imperialism. He cited statistics saying nearly half of the globe’s wealth is controlled by 0.7% of the population while 70% of the people can access only 2.7% of available resources leaving 3.4 billion impoverished, 815 million without adequate food, 758 million illiterate and 844 million lacking in basic services such as clean drinking water. Later that same evening of September 26, a large diverse crowd of people gathered at the Historic Riverside Church on the upper west side of Manhattan. The audience lined up for two hours circling the religious institution having to go through stringent security checks to enter the building. The event was entitled: “Cuba Speaks for Itself”, and was organized by a “welcoming committee” of numerous organizations including the Inter-religious Foundation for Community Organization (IFCO)/ Pastors for Peace, National Jericho Movement, Venceremos Brigade, Communist Workers League (CWL), Black Panther Commemoration Committee, the Northeast Political Prisoner Coalition, among other groups. A program book was circulated with ads from some of the groups which were a part of the welcoming committee. President Diaz-Canal received a standing ovation from the audience when he entered the sanctuary at Riverside Church. The Cuban leader recalled that Fidel had spoken at the same venue in September 2000 where he announced the creation of a scholarship program for students in the U.S. from oppressed communities to study free-of-charge at the Latin American School of Medicine (ELAM). The project began in earnest in 2005 and has since graduated over 170 students from the U.S. who only requirement is that they work in underserved areas. A delegation of ELAM graduates from the U.S. attended the gathering. Two of the graduates, Drs. Sitembile Sales and Joaquim Morante, addressed the audience during the program. Only about five minutes after the beginning of the program, Venezuela President Nicolas Maduro Moros entered the Church. The crowd stood and applauded in amazement. Both presidents sat at the front of the sanctuary together. Maduro in a brief talk at Riverside said he had made a last minute decision to come to New York to participate directly in the 73rd Ordinary Session of the UN General Assembly. Prompted by the speech delivered by President Trump the previous day, Maduro flew to New York where he participated in the UN debate giving a 50 minute address which defended the right of Venezuela to self-determination and sovereignty. During his visit to New York, Diaz-Canal also met with members of the U.S. Congress and a group of people representing the agricultural sector. In addition he spoke before the Nelson Mandela Peace Summit held in honor of the centenary of the late African National Congress (ANC) leader and the first democratically-elected president of the Republic of South Africa from 1994-1999. Note: Abayomi Azikiwe was a member of the press corps which covered the visit of Republic of Cuba President Miguel Diaz-Canal Bermudez and Bolivarian Republic of Venezuela President Nicolas Maduro Moros at Riverside Church.